Just took a walk looking for wood for shillelagh and came back with this. 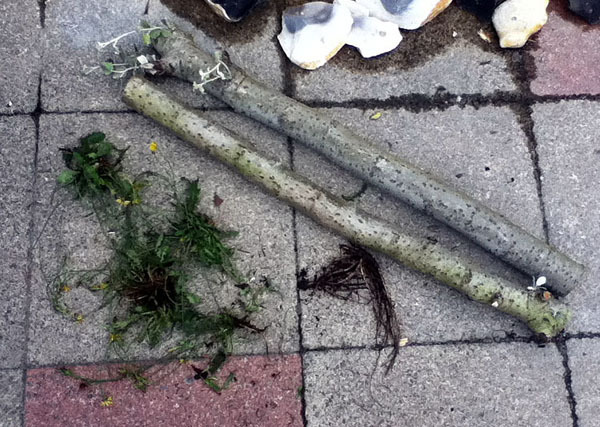 2 nice thick three foot long pieces also I stumbled upon some Dandelion and Burdock roots so grabbed them too. Trouble is no idea what wood it is, it's not in collin's gems. It's got small leaves, some silver some green. It comes from a newly fallen tree, so any ideas what it is and if it works well, thanks. Not sure, but my best guess would be some kind of Poplar or Aspen, possibly a cultivar/cross so hence unconventional leaves and not in the book? Deffo in the Willow family though (sticks neck out). Poplar is a softer wood (i believe that most matches are made from it) and you may find better carvy/bushcraft uses for it than a club or stick... re: Aspen, i know little of the wood, but assume it's not unlike Poplar/Willow ie fairly light and brittle. 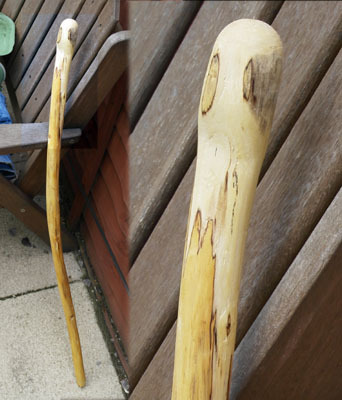 Not the best wood a Shillelagh but i still wouldnt like it smashed off of me bonce! I have some willow sticks that while "light and brittle" have still seasoned to be very hard. I notice that you dont have the joint to a larger brach for use as the head.... are you gonna leave the knotty bits as they are and then shave the rest down? Should make a cool cudgel that way if there is enough thickness. There were no knuckles much on the whole tree, so I picked a really thick piece and will try to carve a ball at the top. I made one a couple of days ago from Sycamore, it was all the wood I could find and not exactly straight. Oooh spalted! very nice! you could try heat bending the middle very slowly, will be an effort as i assume it's off the floor rather than green, but it could work, will just take a few repetitions topstraighten it.